The militarization of the U.S.-Mexico border is one of the defining aspects of the Trump administration. So is climate denial. The two have intersected uncomfortably in the past week. On Friday, the administration attempted to bury a major climate report that including a troubling look at how climate change could cause more human suffering and migration. 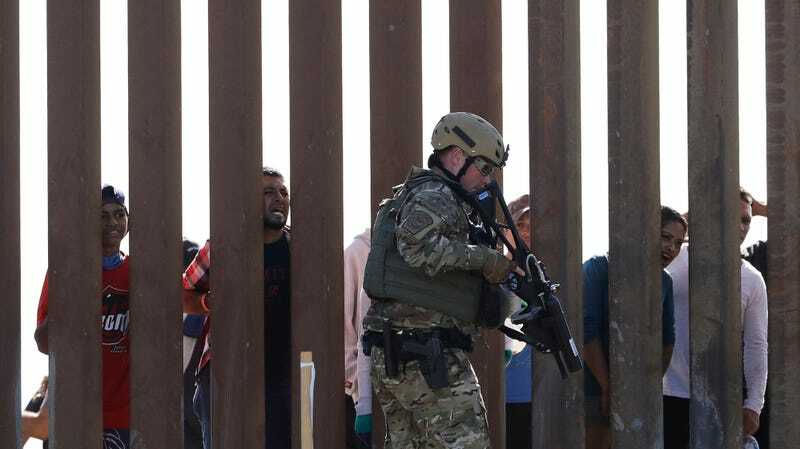 Then on Sunday, Border Patrol forces fired tear gas at migrants seeking asylum and locked down the border crossing between San Diego and Tijuana, making the report’s findings very real by offering a preview of what the future may hold. The National Climate Assessment is focused on the present and future impacts of climate change on the U.S. But owing to U.S. hegemony and globalization, those impacts hardly stop at the border. In the chapter on how U.S. international interests could be hit by climate change, the report points national security concerns, including human migration. Those slower changes aren’t some far off thing anymore. They’re happening now. Research has indicated climate change worsened the drought that contributed to Syria’s destabilization and might have contributed to its attendant asylum seeker crisis in Europe. And climate factors are almost certainly a contributor the influx of migrants from Latin American countries currently headed toward the U.S.
Violence in Honduras, Guatemala, and El Salvador—three of the countries where most recent asylum seekers are coming from—is the immediate cause for people to up and leave. But as with Syria, a widespread drought that devastated farmers in Central America’s Dry Corridor has helped destabilize the region. Coffee rust—a fungus that can kill coffee plants and thrives in warmer temperatures—has affected 70 percent of Central America’s coffee farms and caused 1.7 million workers to lose their jobs. The signs of how climate shifts are already influencing migration, coupled with a report by federal scientists warning the risks of migration and instability will only grow in a warming world would, in a rational world, lead a government to consider how to mitigate these risks. But rather than listening to the red alerts, the Trump administration has doubled down on policies that will drive carbon pollution higher. The president himself has flatly said he doesn’t believe the report. Beyond making climate change worse, the administration is abjectly failing on adaptation as well, particularly in the form of international aid. In announcing his intent to withdraw from the Paris Agreement, Trump highlighted not wanting to pay into the Green Climate Fund that helps developing countries adapt to climate change as well as reduce emissions. That’s a shortsighted approach to aid that will exacerbate inequality and hurt American interests long-term. Instead, the president has repeatedly called for funding for a border wall and fixated on turning the border into what looks like a set piece out of Children of Men. By ignoring the bigger problem, Trump could push the U.S. into a trap outlined in one of its key messages of the National Climate Assessment: a hotter, less stable future will undermine U.S. investments aboard and lead to calls for even more humanitarian aid.